Very Good. Trade paperback (US). Glued binding. 320 p. Contains: Illustrations, black & white. Glamourist Histories, 1. Jane Ellsworth and her sister Melody's lives still revolve around vying for the attentions of eligible men. While Jane's skill with glamour is remarkable, it is her sister who is fair of face, and therefore wins the lion's share of the attention. At the ripe old age of twenty-eight, Jane has resigned herself to being invisible forever. Very Good. 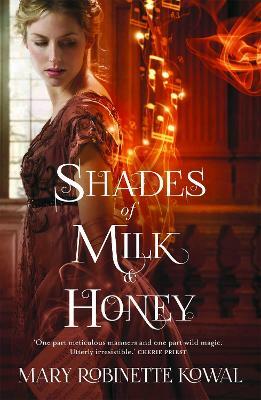 Shades of Milk and Honey is the fantasy novel you've always wished Jane Austen had written. Full of wit, historical nuance, romantic entanglements and domestic magic, this is pure entertainment. 272 p. The Glamourist Histories . Very Good. In a Jane Austen-inspired alternate universe, two sisters, one beautiful and the other skilled in the glamour arts, test the limits of their gifts on an unscrupulous suitor. Glued binding. Paper over boards. With dust jacket. 304 p. Glamourist Histories.